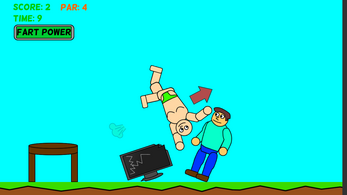 Fart-Man is a ragdoll physics game made for Ludum Dare 32 with the theme of "An Unconventional Weapon." Use your body as a weapon by launching yourself with Fart-Man's less than admirable power. -Smash yourself into furniture and other people to ruin everyone's day! 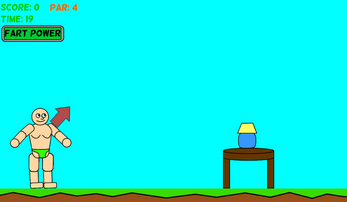 -Collect powerups to maximize farting capabilities. -Fart too much and your fart meter will drain. Created in 72 hours for LD32 Jam by Spencer Larkin.